Hawaiian Host, Hawaii’s original chocolate covered macadamia nut candy manufacturer, and Na Hoku Hanohano Award-winning artist Willie K. are unveiling a new Limited Edition Christmas Medley®, which serves as the perfect gift for the holidays. Willie K. will be debuting two original hit songs “One for the Troops” and “Christmas Time Again” on a free exclusive four-song CD sampler that will be included in Hawaiian Host’s premium Limited Edition Christmas Medley® during the holiday season. 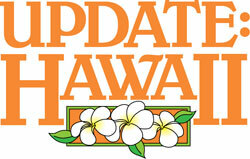 Other tracks include Willie K.’s island rendition of “Jingle Bells (Kani Kani Pele)” and “Ave Maria”. 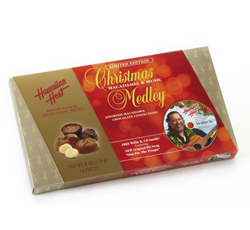 “Willie K. is one of Hawaii’s most revered artists and we are so happy to partner with him in launching our Christmas gift to the world,” said Keith Sakamoto, president of Hawaiian Host, Inc. “Christmas Medley® features a mix of our most popular chocolates, so the gift recipient can enjoy a taste of everything, and at the same time celebrate the holidays with the sounds of Hawaii’s very own Willie K.,” he added. The Limited Edition Christmas Macadamia Medley® is a 6-ounce, 14-piece gift box filled with four types of Hawaiian Host favorites: MacNut Crunch®, Dark Chocolate Macadamia, Maui Caramacs® and Hawaiian Host’s® original Chocolate Macadamia. The Christmas Macadamia Medley® is available at all Walmart locations in Hawaii beginning November 1, 2010. In celebration of the new Christmas Medley®, Hawaiian Host and Willie K. will be touring the islands with a series of mini concerts and autograph-signing sessions at all Walmart locations across Hawaii throughout November 2010. Mililani Walmart at 6 p.m.
Kunia Walmart at 6 p.m.
Kona Walmart at 6 p.m.
Willie Kahaiali‘i (Willie K.) began playing music and entertaining since the age of 10 with his brothers and father, noted Hawaii musician Manu Kahaiali‘i. He captured the attention of the music world with the release of his first three albums, which garnered multiple Na Hoku Hanohano awards. Prior to pursuing a solo career, Willie K. performed with other Hawaii-based musicians such as Amy Hanaiali‘i Gilliom and Barefoot Natives. For more information, visit www.williek.com.